Peckham Architecture is thrilled to share our recent collaboration with Columbia native Ryan Kennedy and Papa’s Cat Café. 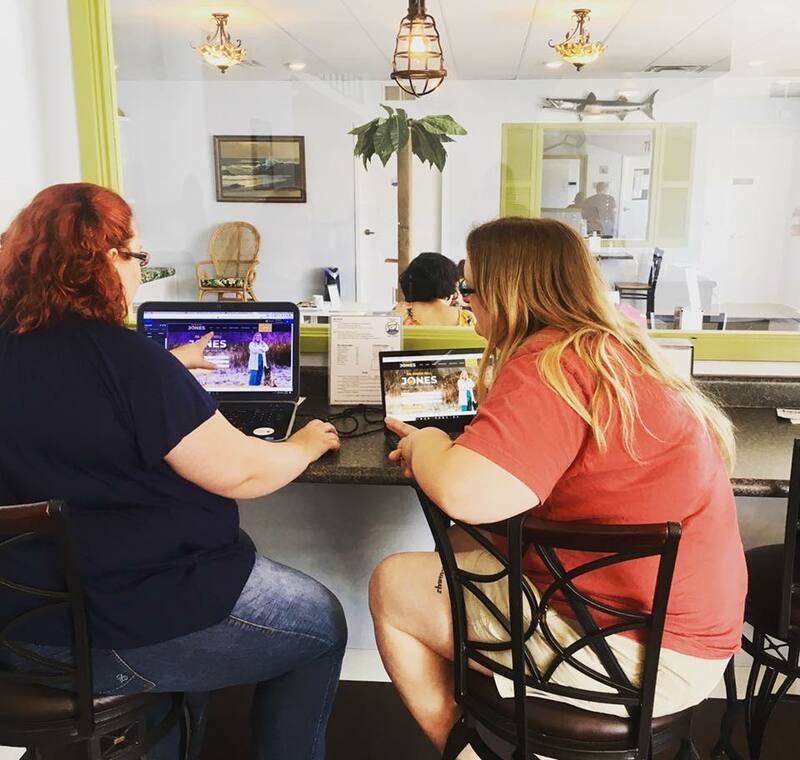 Located at 14 South 2nd Street, Columbia’s first cat café is also a coffee shop and bakery serving organic and vegan options. Cat cafés are for people who want their kitty fix but can’t have a cat at home due to allergies, travel, roommates or other restrictions. Papa’s Cat Café partners with Boone County Animal Care, a foster-based rescue group, to maintain an in-house population of 20 cats. Two cats, Corde and Frankie, reside permanently at Papa’s. The other 18 are available for adoption. View cats available for adoption at Papa’s Cat Café. “It’s like a really big foster home for the cats to get socialized and be able to meet people in a more relaxed environment,” Kennedy says. Like everyone else at Peckham Architecture, founder Nick Peckham is a cat person. Our team was delighted to bring sustainable design elements to such an unusual project. Nick worked with Kennedy to plan energy efficient LED lighting, special ventilation to separate the coffee shop from the cat zone, double ceiling insulation to reduce heating and cooling costs, and high-quality water filtration. To avoid the waste of buying new, we also incorporated pre-owned equipment and furniture in the design. Read the rest of Kennedy’s experience with Peckham Architecture on our Reviews page. 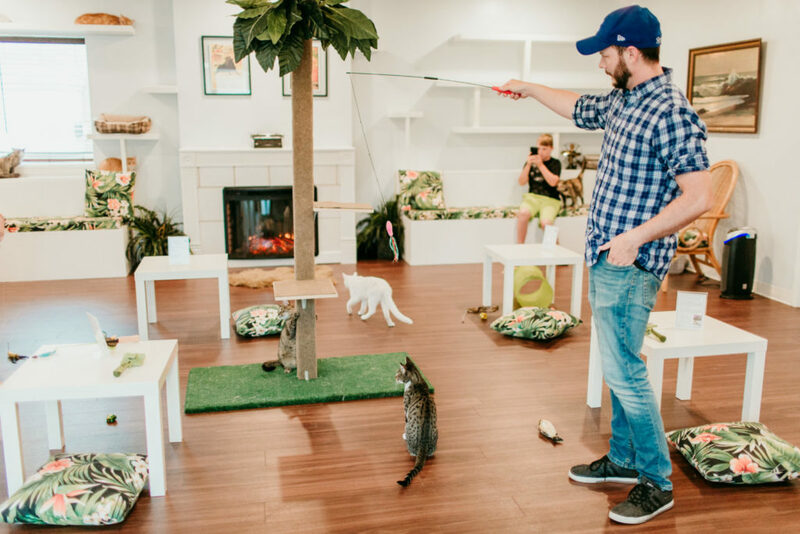 In name and decor, Papa’s Cat Café was inspired by Ernest Hemingway, Kennedy’s favorite author, whose Key West home is known for the dozens of cats who reside there. Papa was one of Hemingway’s nicknames and is also what Kennedy’s daughter calls him. 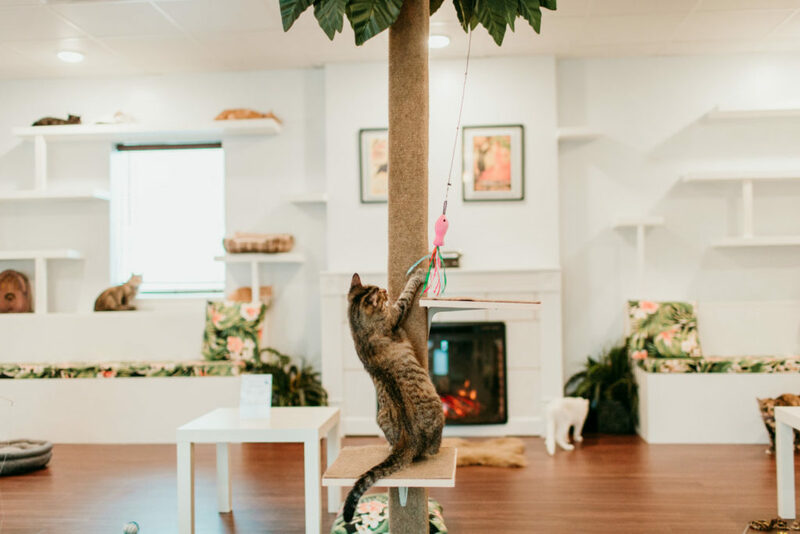 The cat area at Papa’s features a 600-square-foot playroom where cats climb built-in shelves and cat towers, hide in benches, lounge on tropical print cushions and sharpen their claws on a palm tree scratching post. In a separate, 100-square-foot escape room, the cats get some alone time and use the litter box in peace. If you’re allergic to cats or simply wish to keep your distance, you can watch them play through the viewing window between the coffee shop and playroom. 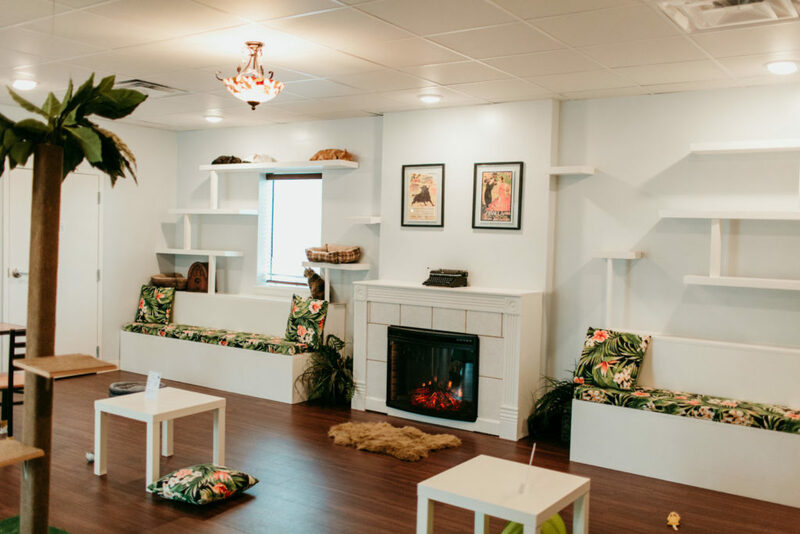 Entry to the playroom includes a free drip coffee when you reserve online. Papa’s also offers Cat Yoga, Saturday morning Cat Academy for kids, a cat-themed book club and even gift certificates. We wish Ryan Kennedy and his crew of kitties every success. We’ll see you at Papa’s Cat Café! Want to make your new construction or renovation more sustainable? Peckham Architecture offers prospective clients a free initial meeting of up to 1 hour.